There is something so gratifyingly innate about making bread. I love the entire process! Grinding flour, kneading the dough with my hands, the rise or two my loaves get and then the best part: the baking! My kitchen is nice and toasty right now ~ the smells evoking a slew of memories of grandma and old church hymns; of a Saturday in Slovenia where my family was invited to our host’s church for a blessing of the food basket before the Easter meal; of friends gathering around my table, as we all prepare to break bread together. Sitting around the table is almost as much of a dying art as baking your own bread… when did we get so busy that it became less important that we make good food to put into our bodies than to just to consume a necessary amount of calories to sustain us through the bustle? And, the amount of people I know who have stopped eating bread because of the “gluten-free” health kick… is bread REALLY a bad guy, dressed so lovingly with butter, smelling so good, just to intoxicate the senses and disorient the consumer? NO, I say, NO, NO, and NO! I sometimes grind my own flower with steel cut oats (love the nuttiness) and use an unbleached wheat flour the rest of the time ~ and I don’t even know who I can share a loaf with anymore! Really, it has gotten to the point where I’m almost ashamed to say I bake bread… not to mention the amount I eat on a normal basis (along with perilous pasta and revolting rice!)! My note to the masses (or at least the 3 people who might read this all the way through:o) ): Stop eating your Wonder bread people! Make a friend who loves to bake bread ~ unless you have celiac or a few other health issues, you can eat bread! Simple recipe follows! Over the past decade, going gluten-free has been touted as a way to boost health and energy, lose weight, or cope better with ADHD, autism, headaches, and other conditions. But who really needs this diet? Long before its newfound popularity, the gluten-free diet was a medical staple — a proven treatment for celiac disease. Perhaps someday, new scientific findings will show that gluten-free diets benefit other health problems, too. But for now, people need a gluten-free diet only if they have celiac disease or gluten sensitivity, a condition that doctors once dismissed, but now are recognizing as legitimate. That’s the advice of Stefano Guandalini, MD, director of the University of Chicago Celiac Disease Center. “People think that gluten-free diets are more healthy,” Guandalini says. “This is, of course, not the case.” In fact, the diet is hard to follow and may pose nutritional drawbacks when people have no medical reason to be on it. In a food processor or blender (I use a Vita-Mix), grind oats into flour. In a large bowl combine 3 cups bread flour, oat flour, yeast, sugar and salt; whisk to combine. With fingers, mix in softened butter until flour resembles crumb mixture. With a long-handled wooden spoon slowly stir in warm water and honey, mix until most of the flour has been incorporated, adding more flour 1/4 cup at a time to make a dough firm enough to handle. Turn dough out onto a lightly floured surface. Knead until dough is smooth and elastic, adding flour 1 T at a time if needed. (If you’re new to this, it may take up to 10 minutes of kneading!) Dough is ready for first rise when it springs back when gently poked. Rinse out your large bowl, butter the inside, place dough smooth-side down, then gently turn over; cover with plastic wrap or flour-cloth. Place in warm, draft-free place until dough is doubled in bulk, about 1-1 1/2 hours. Turn back onto lightly floured surface; cut into desired shape: baguettes (about 6 small), loaves (divide dough in half; gently press into rectangle with fingers; roll up to form log, place in buttered loaf pans; makes two 9″ loaves) or sandwich rolls (about 4 ounces of dough per roll; roll in palms until ball is formed; place seam side down on buttered parchment-paper covered baking sheet; makes about 16 -18 rolls). Let rise for at least 45 minutes. Preheat oven to 425. 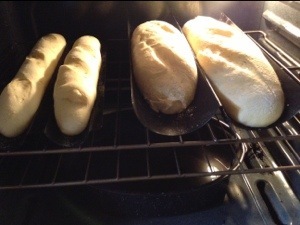 Bake baguette for about 18 minutes; 9″ loaf pans 20-25 minutes; rolls about 10-12 minutes, or until all are golden brown. Cool slightly on cooling rack ~ share and enjoy. Previous Post No Soda Today! Next Post Real Food Served Here!